Monday, March 10th at the Mapleton Conference Center, 52 North Broadway, White Plains. 6pm potluck, program starts at 6:45pm. Jennifer Welles is the Cooperative Coordinator and Housing Developer at Northern Manhattan Improvement Corporation, where she is developing both low income housing cooperatives and a worker cooperative. Recently she organized the first worker cooperative in Washington Heights, Ecomundo Cleaning, a green cleaning company, which was launched in April 2012. We will watch a clip of the film “Shift Change”. Maureen Darras is the Director of Strategy and Planning for the Envisioning Westchester Collective (EWC), of which WESPAC is a founding member. 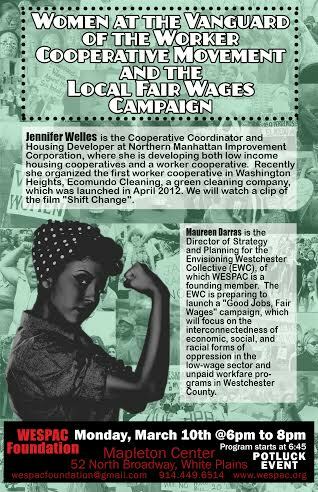 The EWC is preparing to launch a “Good Jobs, Fair Wages” campaign, which will focus on the interconnectedness of economic, social, and racial forms of oppression in the low-wage sector and unpaid workfare programs in Westchester County.